As of 07/12/2018 all tickets have been sold! 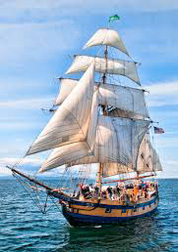 Enjoy a friendly competition aboard the Tall Ships Lady Washington and Hawaiian Chieftain. aboard the magnificent and majestic tall ships when the world was being explored. Meet on neutral ground at the Port of Brownsville to board your time capsule. The Ships will conduct close quarter sailing maneuvers to strategically fire canons (blanks) at the rudder of the other ship. Who will have the weather gauge – only the skill of the Captains and Crew will determine your fate. 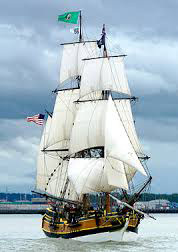 The Crews will be furiously working the sails and lines to capture the wind to propel the massive ships. Which ship will survive and which will be a prize with her cargo? It’s not did we win, but did we survive! YOU can be a SHIP SPONSOR! 2 @ $500, X-Large Font and logo on advertising material and your company Logo/Banner on display on the ship. Receive a plaque of Sponsorship. 4 @ $400, Large Font on Advertising material and Logo/ Banner on display at check in point. All Sponsorships are to Kitsap Maritime Heritage Foundation and are Tax Deductible to the extent allowed by Law. Tickets to attend the battle will be sold for $50.00/person. 1. It is in between Bremerton and Silverdale. Neutral Zone!!!! 2. No interference with the US Navy and Ship Yard. Navy can shut it down(Canons). 3. No interference with the Washington State Ferry System or other large vessels. 4. Easy for the Tall Ships to get underway and lots of room to sail around. Time Line for Battle of Burke Bay Wednesday August 8th 2018. 5:30 Gather at Pavilion at Brownsville Marina. Check in for tickets. Tall Ships…..Schooner VS Square Rigged and vessel shape. Speed vs Maneuverability. Manning of the Tall Ships back in the Age of Sail. Thanking of our Sponsors. 5:50 Load passengers on the tall ships. Walk 2 minutes to Vessels. This is a fundraising event for our local tall ship Schooner Fiddlers Dream, based at the Port of Brownsville. The Schooner will provide education programs for elementary students, entry level job introductions for shipboard employment, sailing adventures in our local waters. Please call Kitsap Maritime Heritage Foundation at 360-633-7421 to reserve your sponsorship. Checks can be mailed to or through our Paypal site (please contact us to use paypal).